... and the Oregon Juncoes have left for the summer. 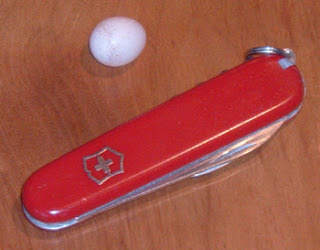 I felt bad enough after disturbing the Chickadee nest last week, but a few days later we found this Chickadee egg on the ground a few feet from where the nest had been. Mea culpa! Mea maxima culpa! 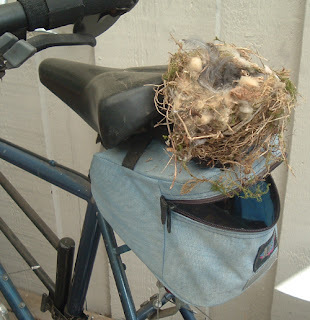 On Easter Sunday I was cleaning off my front deck when I noticed a bunch of dead leaves, twigs, and other litter hanging out of the zipped-open tool pouch hanging from the seat of my bicycle. Annoyed, I brought over the garbage can and began pulling the trash out. At the bottom of the trash, I was surprised to find a newly-built nest! Here's a picture of the nest and the tool pouch it was in. Based on its size, and the materials used (small twigs, hair, moss, insect cocoons, and feathers), I think it was a Chickadee's nest. Feeling guilty about ruining it, I put up a birdhouse a few feet away. This Song Sparrow sings two of his songs today near the SeattleBirdCam.